As I mentioned in my last post, I am working on a series of Free Crochet Lessons in video tutorial format. I will be sharing the basics stitches, how to read them in written patterns, how to read them in crochet diagrams, and more importantly I will show with video and step by step instructions how to crochet. So, welcome to the second lesson!! 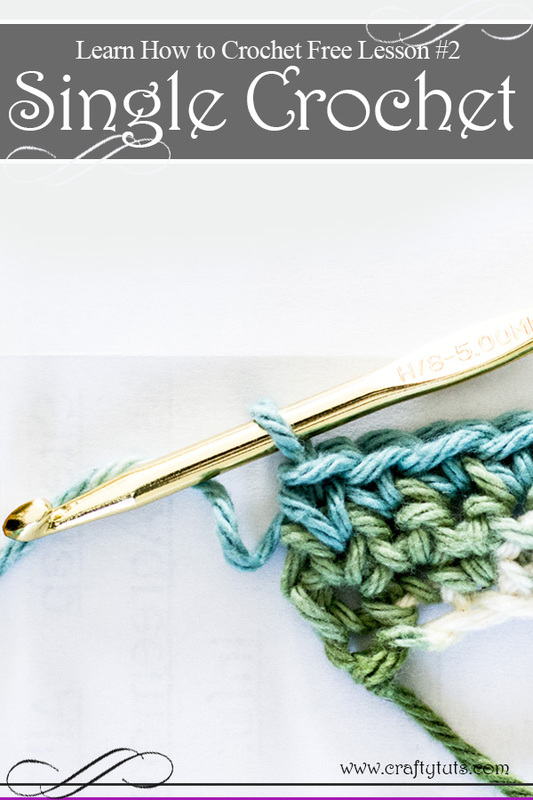 In this crochet lesson I will be showing you how to do a “single crochet” stitch and also how to read them in written patterns and diagrams patterns or crochet charts, so you won’t only be able to create a single crochet stitch, you will also be able to follow a pattern! In diagrams, the single crochet stitch is often represented with a plus sign + , but sometimes is also represented as an x. (watch the video for more details). To create the single crochet: Insert hook in the center of next chain, yarn over, draw yarn through stitch, yarn over, draw yarn through 2 loops on hook. Repeat across to end of foundation chain. To begin the second row, turn your work. Some people do chain one, while some don’t. Refer to pattern for specific instructions if you need or don’t need to chain one before turning. Check this project, perfect for beginners, as it only uses the chain stitch and the single crochet stitch. Lovely – thank you…going to get going! !